NVIDIA has announced their financial results for the fourth quarter of Fiscal Year 2018 and made some record highlights. During the quarter, NVIDIA posted a record quarterly and full year revenue of $2.91 Billion and $9.71 billion, respectively. The record breaking earnings were a direct result of the success NVIDIA garnered from their Gaming and Datacenter markets which made up the bulk of their cash flow. During the quarter, NVIDIA GPUs gained increased in popularity in the cryptomining market which saw large supplies of NVIDIA gaming GPUs also known as GeForce GPUs ending up inside crypto mining machines rather than gaming PCs. This led to major shortages of NVIDIA and competition GPUs in the market. As such, the limited stock that was available at retailers skyrocketed in terms of prices. We saw the likes of GTX 1060s and RX 570s touching more than $600 US while GTX 1080s were selling for over $1000 US. 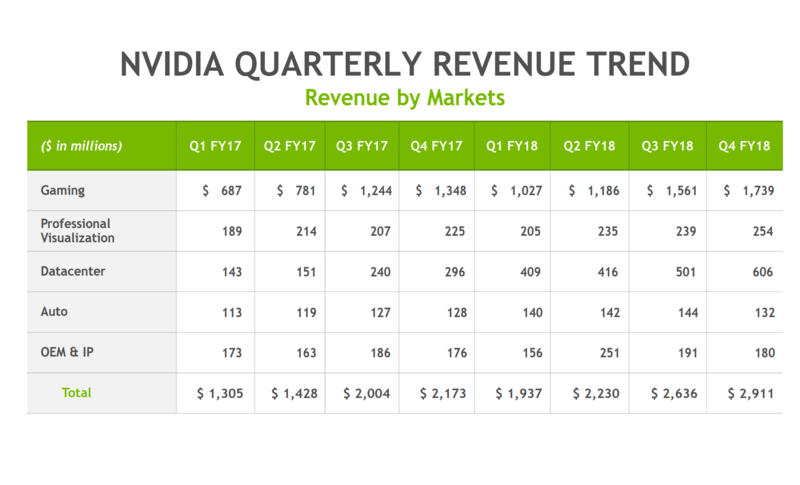 The NVIDIA Q4 FY 2018 earnings report show a large increase in gaming and datacenter market revenue. 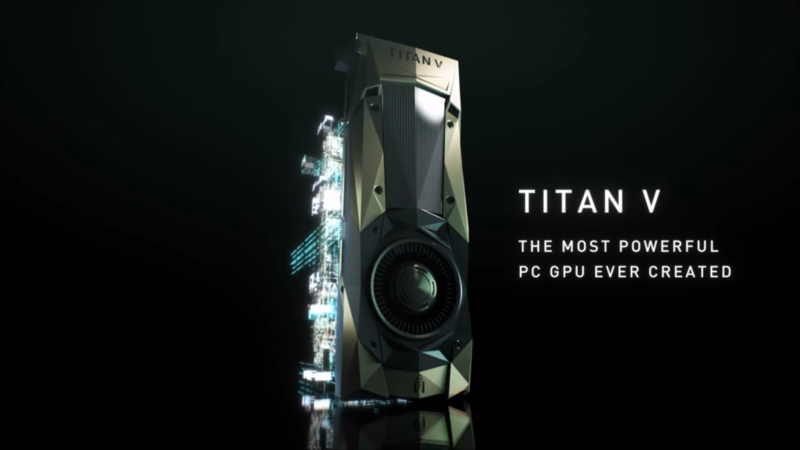 All of these NVIDIA GPUs being sold to miners were based on the Pascal architecture and the company has stated that they will be ramping up production to address the supply shortage currently affecting the market. We’re working really hard to get GPU down to the marketplace for the gamers and we’re doing everything to advise retailers and system builders to serve the gamers. And so, we’re doing everything we can, but I think the most important thing is we just got to catching for supply. 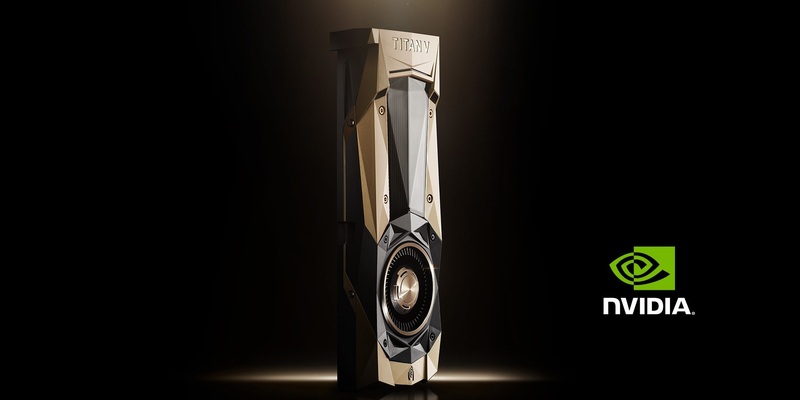 According to NVIDIA’s Executive Vice President and Chief Financial Officer, Colette Kress, NVIDIA saw a very strong demand in cryptocurrency which even exceeded their own expectations and hence it amounted for a higher than usual percentage of revenue. Strong demand in the cryptocurrency market exceeded our expectations. Cryptocurrency mining accounted for a higher percentage of revenue than the previous quarter. Keep in mind that’s very difficult for us to quantify down to the end customers view. Our main focus remains on our core market, as cryptocurrency will likely remain volatile. Jen-Hsun Huang, the CEO of NVIDIA, also clarified that they don’t set prices at the retail end of the market. They are trying to their fullest capacity to solve the supply and price problems, but they can only do so much. The NVIDIA Titan V is the fastest and most powerful graphics card designed to date, featuring the most advanced GPU design known as Volta. The reason is that the demand is great and is very likely to continue to remain this way in the coming quarter. Hence, they can only work to increase the supply by working with their suppliers which consist of the largest semiconductor manufacturers in the world (TSMC) and they are responding back correctly by increasing supply to catch up to demand. We don’t set prices at the end of the market, and the best way for us to solve this problem is, work and supply. The demand is great and it’s very likely the demand will remain great as we look through this quarter. And so, we just have to keep working on increasingly supply. We have our suppliers who are the worlds best and largest semiconductor manufacturers in the world and they’re responding correctly and I’m really grateful for everything they are doing, we got to do a catch up to that demand, which as such is really great. Finally, NVIDIA’s CEO acknowledged that even with all their efforts, they are just constrained since they are 10 times larger a GPU supplier than the competition. AMD highlighted during their earnings that memory supply was behind GPU shortage in their earnings last week. There is indeed a DRAM shortage but whether NVIDIA is affected as much as AMD who relies on HBM2 rather than GDDR5 / X like NVIDIA remains to be confirmed. We’re just constrained. Obviously, we’re ten times larges of a GPU supplier than the competition and so we have a lot more suppliers supporting us and a lot more distributors taking approach to market and lot more partners distributing our products all over the world. And so, I don’t know how to explain this right from demand is just really great. And so we just got to keep our nose to it and catch up the demand. We will have more details on the NVIDIA Q4 Fiscal Year 2018 earnings posted in an in-depth article very soon. Do look forward to it for the full revenue breakdown and upcoming quarter (Q1 FY’19) expectations.